Borgeson 999032 Power Steering Conversion Kit Fits 68-82 Corvette. Manual To Power Steering Conversion Box. 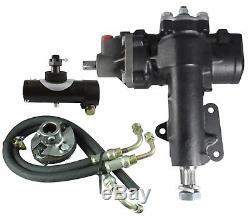 Power Steering Conversion Kit; 1 in. 48 Spline Column; Complete Kit. WARNING CA Proposition 65: Yes. WARNING CA Proposition 65 Message: WARNING: This product can expose you to chemicals including Nickel and Chromium (hexavalent compounds) which are known to the State of California to cause cancer or birth defects or other reproductive harm. The Borgeson conversion box is a re-manufactured GM Delphi 600 integral power steering gearbox. The Delphi 600 represents the latest generation of integral power steering gearbox technology with true modern power steering feel, feedback and a sporty 12.7:1 ratio. Borgeson has re-manufactured this box to bolt directly to the factory mounting location and to fit the stock pitman arm. A new rag joint will be required for connection to the stock column. The factory column will need to be collapsed or shortened 1-2 for clearance of conversion box. Also a drag link adapter will be required for cars with factory style power steering. Eliminate your leaky control valve and feel the road with a new integral power steering conversion from Borgeson. The Borgeson Universal Company has been manufacturing steering universal joints and components for the industrial, automotive, military and aerospace markets since 1914. Borgeson has continued to develop and produce the most dependable steering components available. 16.000 X 16.000 X 8.000. Racks for All was created to serve the needs of outdoor enthusiasts who travel extensively with their gear and enjoy customizing their vehicles. We aim to provide a better shopping experience and the most competitive prices on a wide variety of automotive parts and accessories, outdoor gear, vehicle racks and related products. Our goal is to differentiate ourselves by providing excellent customer service, so that you can select the right product at the right price, and enjoy doing so! Thank you for visiting our site. We would like you to become our customer. The laws of the Commonwealth of Massachusetts shall govern these terms and conditions, without reference to its choice of law rules. Racks for All makes no representation that the information in the Web site is appropriate or available for use in other locations, and access to the Site from territories where the content of the Site may be illegal is prohibited. Credit will be made after merchandise is received by Racks for All and found to be in new and unopened condition. This listing is currently undergoing maintenance, we apologise for any inconvenience caused. The item "Borgeson 999032 Power Steering Conversion Kit Fits 68-82 Corvette" is in sale since Tuesday, October 25, 2016. This item is in the category "eBay Motors\Parts & Accessories\Car & Truck Parts\Suspension & Steering\Steering Racks & Gear Boxes". The seller is "racksforall" and is located in Wilkes-Barre, Pennsylvania. This item can be shipped to United States, Canada, United Kingdom, Denmark, Romania, Slovakia, Bulgaria, Czech republic, Finland, Hungary, Latvia, Lithuania, Malta, Estonia, Australia, Greece, Portugal, Cyprus, Slovenia, Japan, Sweden, South Korea, Indonesia, Taiwan, South africa, Thailand, Belgium, France, Hong Kong, Ireland, Netherlands, Poland, Spain, Italy, Germany, Austria, Mexico, New Zealand, Singapore, Switzerland, Norway, Saudi arabia, Ukraine, United arab emirates, Qatar, Kuwait, Bahrain, Croatia, Malaysia, Brazil, Chile, Colombia, Costa rica, Panama, Trinidad and tobago, Guatemala, Honduras, Jamaica.